As a Certified Professional Dog Trainer (CPDT-KA) Cecilia is a Professional Member of the Association of Pet Dog Trainers (APDT). With 20 years of professional experience in dog training, she uses only the most modern, dog-friendly methods, based on the science of learning theory. She stays on top of the latest scientific discoveries in learning, and keeps educated with ongoing training and continuing education. Last week, I gave an update on Tesla’s training in the past year, detailing what we have accomplished in terms of her basic behaviors, with the simple goal of making her much easier to live with in our family environment. Here, I detail her more advanced training, and how we hope to achieve the goals of a truly competitive sports dog. Flyball training – For those who don’t know, flyball is a competitive dog sport whereby a relay team of four dogs and handlers send their dogs over four hurdles to retrieve a ball out of a spring-loaded box, to return with the ball over the hurdles before the next dog in line goes. When I got Tesla, she had absolutely no interest in the ball. She would chase it when thrown because it was moving, but had no concept of the retrieve. This was actually a good thing, since exceedingly ball-obsessed dogs are sometimes less than motivated on the return of a flyball course, since they already have their prized ball. So I took this slowly. First, I encouraged her to play lots of tug with me. Then I gradually introduced her to the ball, first chasing it, then picking it up, and eventually retrieving it, and working up to retrieving it when it was not moving. Now, she readily retrieves a ball, running full speed both outbound and on the return, which is exactly how we want it. She is bringing the ball all the way to my foot 95% of the time on the flat, though we are still working on the full retrieve to me in flyball over hurdles. With all of the distractions and added tasks, including jumping the hurdles, turning on the flyball box, and ignoring the dogs in adjacent lanes, she still has challenges with the full course. Speaking of hurdles, I got lucky with the jumping – she loves to jump, and once we lined her up in front of the hurdles (first jumping to me over 1, then 2, then 3, then 4 hurdles in a row) it has never occurred to her to go around the jumps instead of over them. The only time she’ll miss the hurdles on course is if she bobbles the ball and ends up completely off-course. We have entered a couple of tournaments, but she was primarily only successful in warm-ups, with just two successful in-race runs at our tournament in May. Still no flyball points due to her distractibility, which I discussed last week. 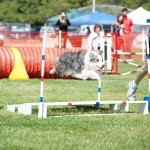 Agility training – Although I originally thought she would compete in Flyball before Agility, I may be proven wrong. While she still barks at running dogs when she is waiting her turn, her focus when we are working together has improved dramatically. I am more than fortunate to have an amazing agility instructor in Sam Cohen, who not only understands that different dog/handler teams have different needs, but who also has the patience to allow a dog training colleague (me) to do what she needs to do in class for her dog to succeed. I spent many an hour in the early days of foundation courses just turning and leaving the classroom because Tesla was about to lose her mind amidst the distractions. And it has paid off! She can now perform sequence drills in class and (mostly) ignore the other working dogs, as long as I have her focused on me and working. We have, thus far, entered one fun match, and it went well, after initial distractions. Not sure that we’ll be quite ready to trial before the end of this year, but by next season for certain. As to equipment and handling, well, that has been the easy part for her, and more of a challenge for me. In private training sessions, she is wicked fast when sequencing equipment, and has forced me to work hard to improve my timing and positional cues in order not to drive this race car into a wall, so to speak. Trialing with her will be SO much fun! Class Assistant (Demo Dog) – This is her actual “job”, if you want to call it that. Considering that, when I first got her, she was not able to stay inside a classroom with moving dogs for even a few seconds without screaming, I’m absolutely pleased with her progress up to now. The adoption of Tesla allowed my old girl, Claire, to finally take a well-earned retirement. She was ready. The best news is that Tesla seems to enjoy the work as much as Claire did when she was younger. And now Claire gets to enjoy hanging out on a blanket and being brushed, chasing her boomer ball around the yard, and playing with the occasional water spray from a hose. After over a year of training, including an initial three months of frustration and hard-core work with her, I can say with confidence that Tesla is becoming a really nice working dog. Of course, this didn’t happen by accident. And the lessons that I have learned while teaching her are among the best that I could have hoped for. Finally, a dog with an “off” switch! If you think you have a young dog like Tesla, and you are at your wit’s end with the reactivity and crazy energy, don’t despair! Contact a local force-free trainer to assist you. In the long run, it will be more than worthwhile. Tesla turned 2 years old this month. 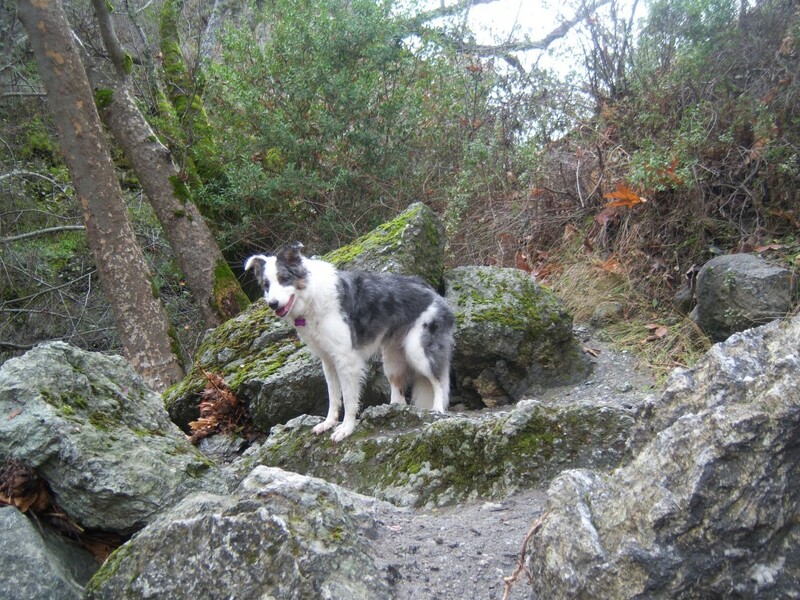 Sometimes it feels like it was just yesterday that I brought home this lovely yet out-of-control 10-month-old puppy from the Marin Humane Society, with their insistence that she was “not very drivey.” Well, I wanted drivey, and I certainly got it, with drive to spare! In the past year, I have spent countless hours in training classes as well as at home and on-the-road training with her in order to shape her into the perfect dog that I’d been seeking. And while I don’t expect (nor want) her to be another Claire, heart dog extraordinaire and quite possibly the best working dog I’ve ever had, she is coming along nicely after all this time. As my colleagues and flyball teammates often say, her brain is solidifying nicely now, though we still have a way to go. 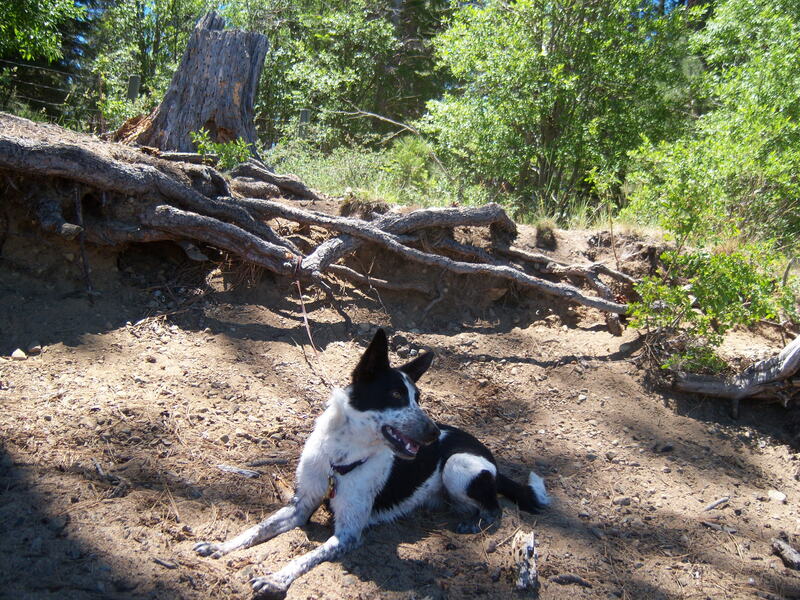 Reactivity and Distractibility (aka being an adolescent herding dog) – One of Tesla’s principal personality points when I first got her was a propensity to chase virtually anything that moved quickly, including but not limited to bicycles, dogs, people, critters, etc. And if she couldn’t chase it, she would bark and howl at a fever pitch. I learned of this at our first flyball event, a demo just a few short weeks after I adopted her. 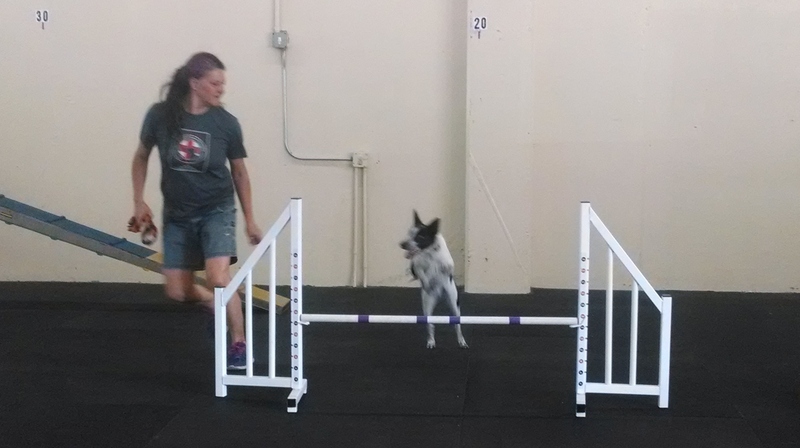 I had already seen how she was at flyball practice, barking at the dogs when they ran, but this was nothing compared with the highly over-stimulating environment that included adjacent agility and flyball demonstrations. Although she did great on recalls over the jumps, when she wasn’t in the ring, I had to be farther than two football fields’ distance for her to even start to calm down enough to stop barking and reacting! And forget about any kind of focus. So, I enrolled her in a multitude of classes – all concurrently – and mostly worked on her reactivity. I learned that she was reactive because she wanted to be in the action, so I formulated a protocol incorporating negative punishment , wherein I would leave the “action” as soon as she started to react. In other words, bark = turn and leave the room (as I said “too bad”). Initially, she was so reactive that I would turn and leave class with her whenever she’d bark loudly. Gradually, I was able to increase the criteria until she was barely allowed a yip otherwise I’d walk her away from the action. After a year, we are still working on this in higher action settings, such as in agility class when other dogs are running fast. Overall, however, she has improved dramatically, as anyone would attest who has previously seen her in action. Running Partner – My favorite activity in the world has always been running, and running with my trusty canine partner has been my dream since I was a child. (Truth: I was a runner long before it was ever a “thing”!) I’ve had a number of awesome running partners throughout my life. So, naturally, Tesla was destined to fulfill this legacy of past canine running mates. Boy was I in for an exasperating surprise; on our first ever run together, about 3 months after her adoption (and 1 month after her 1st birthday), I learned that bicycles were more distracting to her than any other known trigger. At a local park trail on that first day, I heard a screaming that I think few besides Cattle Dog owners can accurately describe. Yes, it was a scream, not a bark. A sound that probably still lingers in outer space somewhere. The toughest part was that treats are not remotely interesting to her in that context. So, I had to find something else.Taking a tug toy on a run was inconvenient, and potentially dangerous to my fingers in such a frenzy, so I decided to use the run itself as reward. I started – after that first run fiasco – with bicycles at a more “workable” distance, and practiced “leave it”, which she had already learned in other contexts. If she effectively turned her head away (= leave it), I would reward her by marking “yes!” and breaking into a short sprint. If she barked or even tracked the bike with her snout instead of effectively leaving it, I would say “too bad” and stop running, taking hold of her harness and holding her close to my leg. In this manner, I restricted her movement in an improvised Time Out. It took many months, but we have found success! Now a bicycle can pass us, even at high speed, and I often don’t even have to tell her to “leave it”. We still break into a sprint as reward, but I don’t have to go as long nor as fast as before. 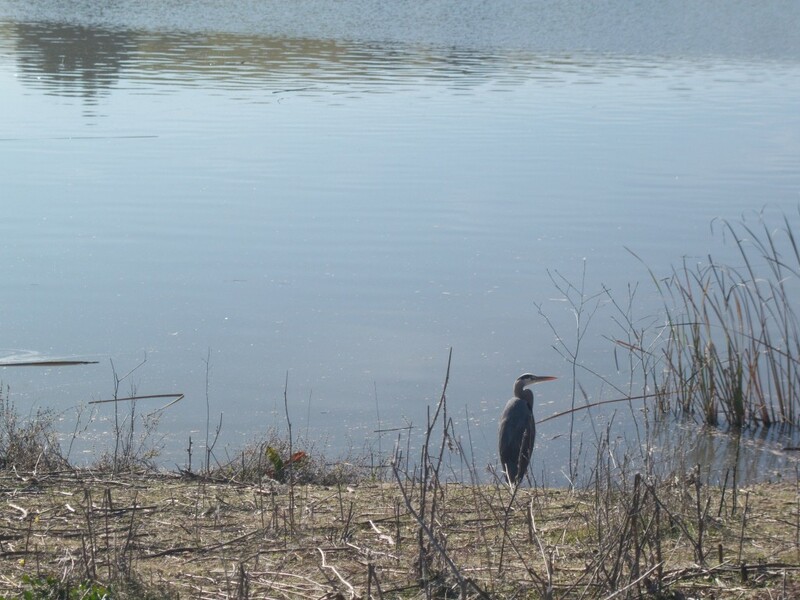 The biggest challenge on this training path was a mistake I made on New Year’s Day: I decided to have my annual New Year’s Day run with her on a busy cycling/running/walking trail. I ended up cutting the run short when it turned into essentially two miles of wind sprints. We passed families and extended families along the trail – sometimes as many as 8-10 cyclists in a row! WHEW! Lesson learned. Now when I counsel my clients to avoid the overly challenging situations, I look back on that run and realize that sometimes, things just happen because we can’t predict everything all the time. She loves children – yes, loves them. She pulls to greet them. The first time she and my daughter made eye contact, the look of pure joy on her sweet face and completely wiggly happy body were a thing of beauty. She’s built like an athlete, with the heart to match – and true to form, she is maturing into a great competitive sports dog. Of course, the chew toy training, potty training, etc. were as I expected for an un-trained adolescent dog, so no challenges out of the ordinary there. But she was not quite the perfect house dog. Tesla was originally rated by a shelter evaluator as a dog not well-suited for families with children under 10 years. As many of you know, my daughter, Shelby, was just over 3 years old when we got Tesla. We had a lot of work to do for them to be safe together, including teaching Tesla not to nip at Shelby when she moved. I closely supervised (and still do) all interactions, calling and implementing Time Out’s whenever she even thought about nipping at the kid’s clothes. After several weeks of this, I watched her turn her head to start to nip at Shelby’s skirt, and I called “Time Out!” Before I could get to her, Tesla put herself in time out up against the fence. I started to count out the 30 seconds, but only got to 26 before I took pity on her – she looked so upset – and I verbally released her. At the release, she immediately recovered her composure, and went back to running in the yard, but keeping her distance from the kid. She hasn’t nipped at Shelby again when they are both in the yard moving. And now, we can even go on runs together without a problem. This is excellent progress for an adolescent dog. Still work to do. I have had many a client adopt a dog similar to Tesla, and become frustrated when they cannot resolve these behavior challenges within the first few weeks. It is a hard thing to say, but it can take many months to resolve reactivity in a dog, and sometimes longer depending on the dog’s genetic predispositions and background. (That’s right, nature and nurture.) What I can say is that it has been absolutely worthwhile to work through Tesla’s challenges to achieve what I have achieved with her thus far. Note: This article was previously published at www.cratesandcribs.com. It has been revised for publication here. I recently received an email from a colleague out of state, in a quandary over a client who was looking at euthanizing their one-year-old Border collie due to incidents of nipping. They currently have four children, and the dog is nervous, and has nipped people on several occasions. From my understanding, based on the email thread that we exchanged, the dog has not caused any serious damage, and all bites where on a Level 2 of Ian Dunbar’s Dog Bite Scale. This means that the dog has caused minor scratches or cuts not requiring medical attention. More recently, I received yet another such email from another rescue colleague who had to take a 6-month-old pup back from her adoptive home because the training that she had done with her when she was being fostered did not transfer to the reasonably experienced dog-owning family who was not quite ready for a high-energy puppy. 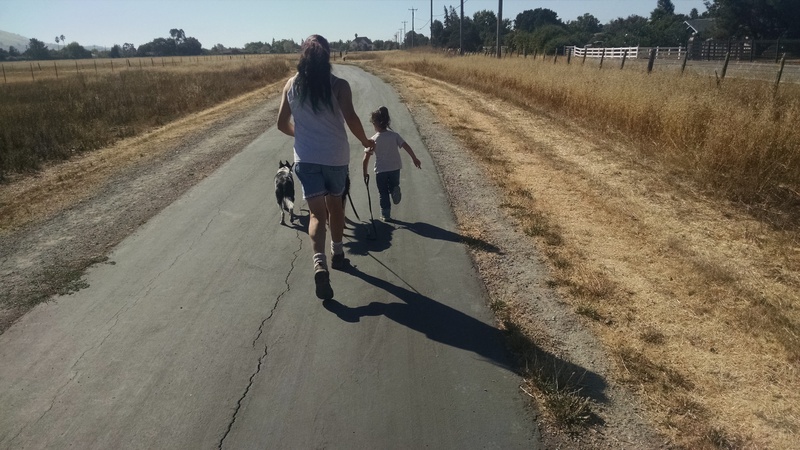 Concurrently, as many of you know, I recently adopted a now fourteen-month-old Border collie pup, whom I’ve been training along with my three-year-old daughter. Tesla jumped up on Shelby, and Shelby – to my proud surprise – turned away from her each time! Within a week, she stopped jumping up on her almost completely, with just one exception when Shelby was upset about something (unrelated to Tesla) and Tes saw her crying. 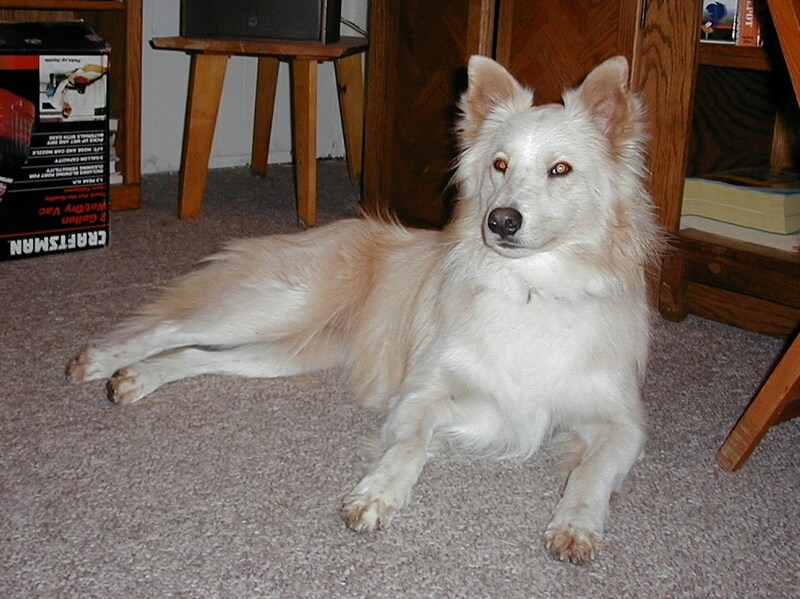 Tesla also exhibited herding behaviors, which included nipping at Shelby’s clothing and legs whenever she ran. I re-emphasized the rule: “No running when you are with the pup”, and between that rule, very close supervision, and several well-executed time outs, Tesla is no longer nipping at Shelby!! In fact, Shelby is now able to run around the yard with Tesla without incident – needless to say, they remain closely supervised. I keep thinking back to the dogs that my colleagues have emailed about. I don’t have further information as to their dispositions, but my instinct is that these were just the wrong placements, and that perhaps, with more experienced high drive dog owners, the dogs could potentially thrive. Recently, Kelly Gorman Dunbar wrote a fabulous article for Bay Woof magazine about how to choose your ideal dog. 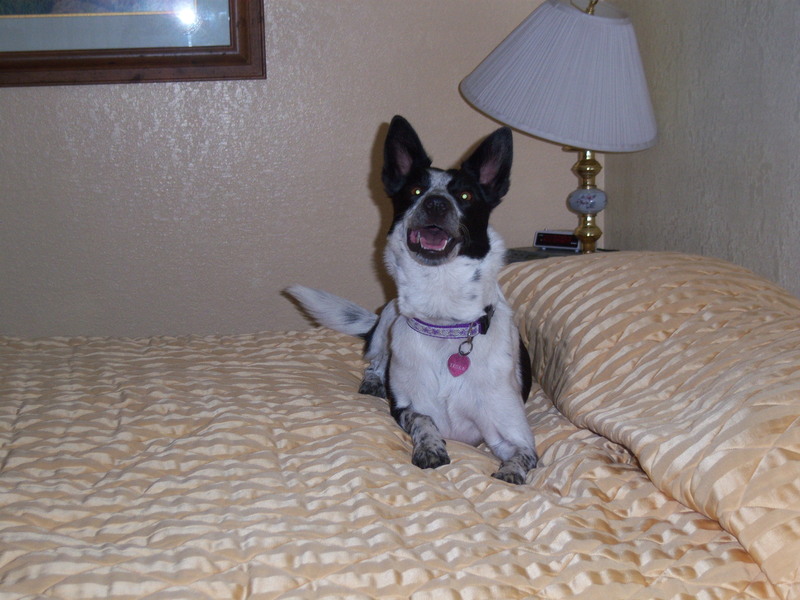 If you already have a high-energy dog and are experiencing challenges, contact a qualified trainer for assistance. But if you haven’t yet chosen your next pooch, please carefully consider your choice! 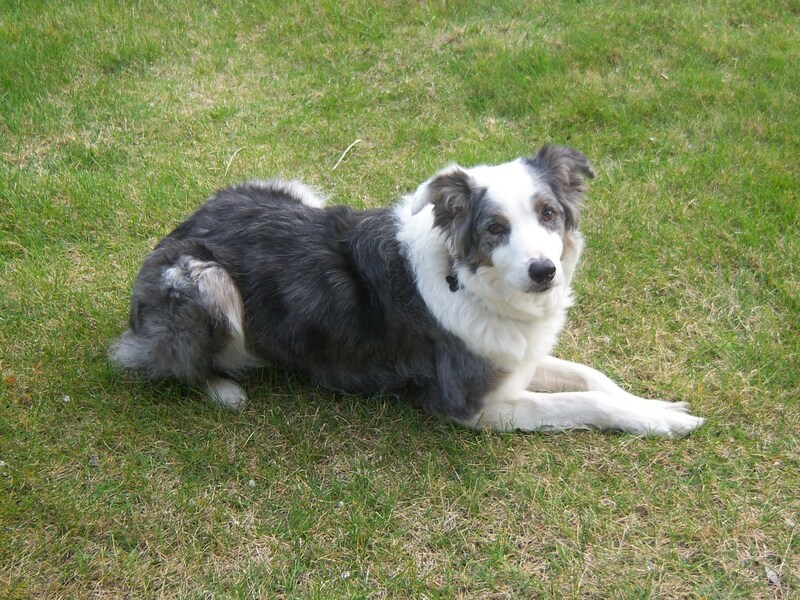 If you do not have the hours each day that it takes to mentally and physically wear out a high energy Border collie, cattle dog or Australian shepherd, consider a quieter breed instead. Many calmer dogs can still make nice sports dogs while not requiring that your life revolve around them. Since my last post here about Tesla’s training, I’ve had several clients ask the question: how many sports can you teach a dog simultaneously, and should I consider starting several at once? While I have started my new pup in basic training plus 2 different sports already (and I may add a 3rd sport soon if the schedule permits), I don’t typically recommend this to the handler who has not practiced the chosen sports before. This is not because the dog can’t do it, but because it can get fairly complicated for the handler to switch gears completely from sport to sport. 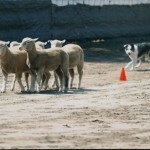 When I first started herding with Claire, my heart dog, my coach told me that “those agility and flyball dogs don’t make very good herding dogs.” She was referring to the sports in which Claire and I were already competing, and suggesting that Claire would not be a good herding dog because of our multi-sport background. 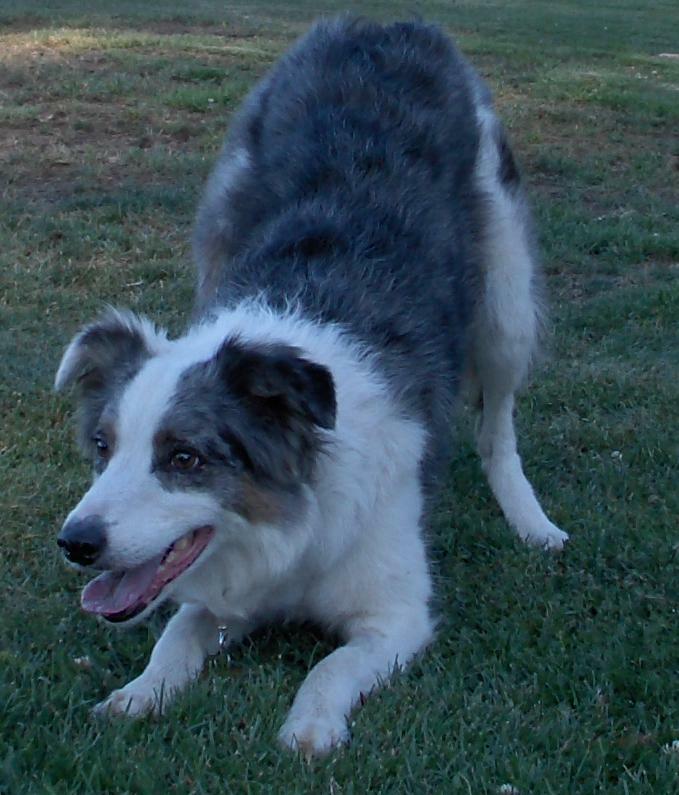 As it turned out, she was a great herding dog, and quickly went on to a Herding Ranch Dog title. 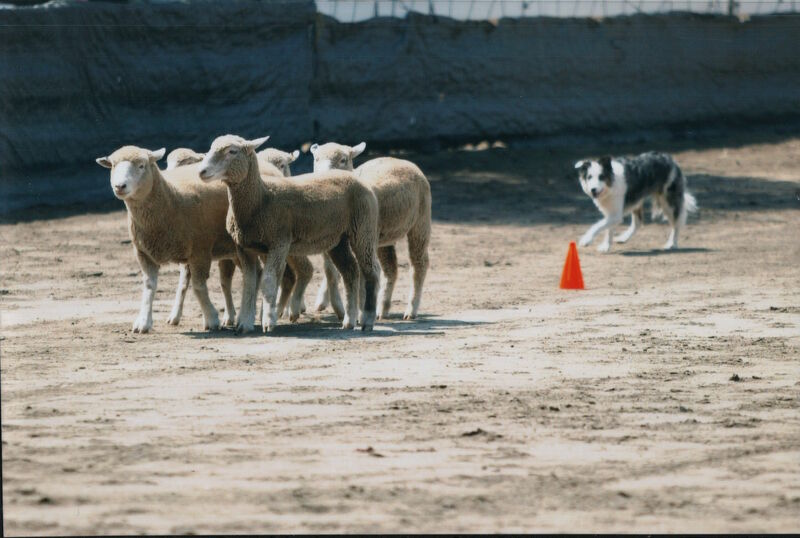 My coach even said to me later, “she’s a great first herding dog for you.” HA! I knew it! I couldn’t help but wonder why she would have made that original comment to me in the first place. 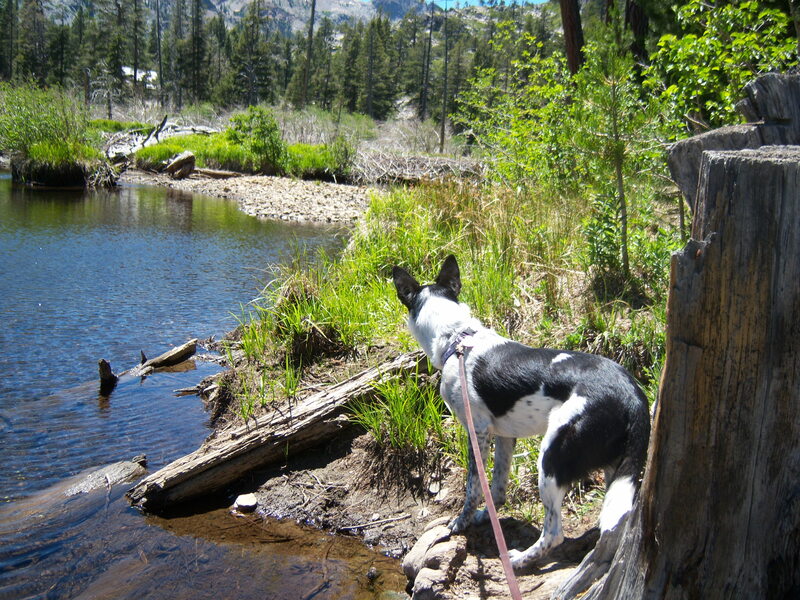 Then, as I reflected on my personal challenges when I first started herding, I realized that it’s not typically the dogs that have the problems with cross-training, but the handlers. To give us credit, the humans do get the harder part of the job in any dog sport. We have to memorize courses, know how to signal our dogs, know when to give certain signals, be able to read our dogs, know what to expect in different environments… not to mention consider what we’ll be doing for dinner than night and, oh yeah, what about that big report due on Monday… All that the dogs have to do is follow our signals. This is why owners are often disheartened when an instructor takes their dog for a demo and makes the dog look like a superstar. How often have I heard a student say “the dog is smarter than I am”, or “my dog would be great if she had a better handler.” OK, so I’ve said these things, too. But the fact is, we humans do have much more to think about than our dogs ever do. So back to the question of how many dog sports to start at once: that depends on you, the handler. If you are sufficiently experienced in multiple sports as to avoid confusion for your dog, then training in them simultaneously shouldn’t be overly complicated. In fact, many dog sports have a number of training exercises in common, including restrained recalls, targeting, and focus work. However, if you are not already very familiar with a variety of sports, then I highly recommend choosing one at a time to teach yourself and your dog. In this way, you can get your signals and communication clear, and also make a decision as to which sports you enjoy the most. Because, after all, if you are not really enjoying a particular sport, chances are that your dog will not either. Just like us, our dogs want to do what is most fun. And the most fun a dog could have is in playing with his or her human. If you are not certain which sport to choose for your dog, check out my dog sports resources page. And as always, Happy Training! Besides, I now have a new pup to write about! Tesla – convincing me to take her home. At a flyball tournament hosted at the Marin Humane Society a couple of weekends ago, I show up at camp on Sunday morning, ready to race. 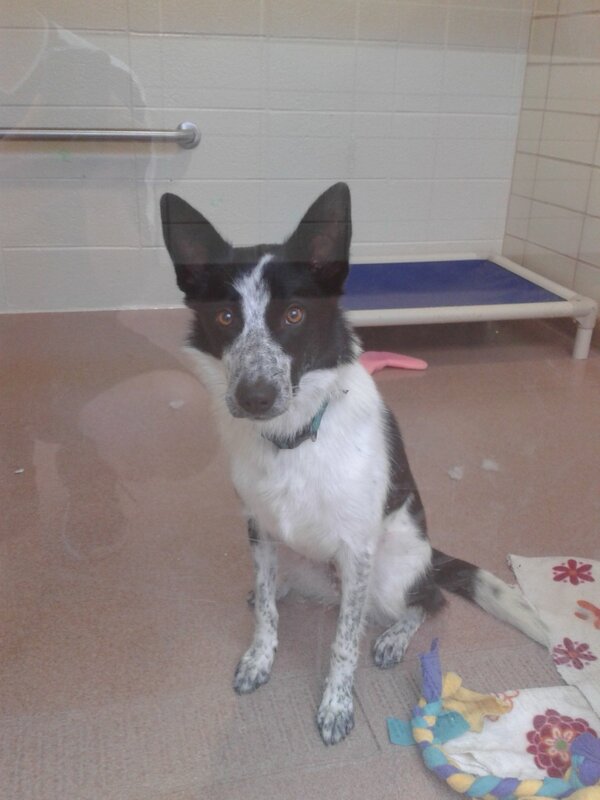 As soon as I walked in, all of my teammates began to insist that I needed to go see this adorable, 10-month-old border collie pup in the shelter. Not completely convinced, I walked in with my daughter to look at dogs and… there she was. We locked eyes – what focus! Then, as my 3-year-old approached her window, her ears went back, eyes soft, and she stretched into the most adorable greeting ever. SHE LOVES KIDS! To be clear, I had been looking for a new dog for quite a while. Been following the whippet lists (among my top choices for a next dog) as well as having feelers out to all of my colleagues at shelters and in rescue. I’d even looked casually at a few dogs that seemed like good prospects. I did not, however, go to the tournament planning to get a dog – or any other pet for that matter. Other than not being a whippet, this pup fit all of my criteria: smallish size (she’s just 29 lbs at 10 months, so will hopefully stay on the smaller size of border collies); great focus’ short coat; friendly with dogs and people; and she loves kids. 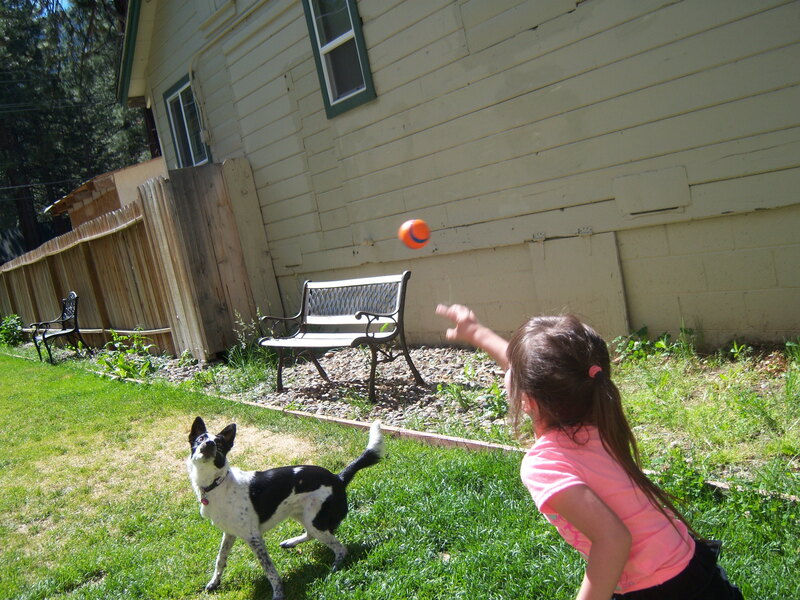 Now this last point may seem minor for a sports prospect for someone who specializes in working with children and dogs, but the fact is, actually loving kids the one thing that I really couldn’t teach a dog. I couldn’t teach it to anyone, actually. Either you love kids or you don’t. I could teach a dog to tolerate children, learn to avoid them if they become annoyed, and even condition them to like certain children. But loving children in general would be tough. As they say, you can’t make someone love you, and so I can’t make a dog really love kids. Needless to say, I’m enjoying the training, and I plan to be chronicling it here periodically. As of today, we’ve had her for 12 days, and she has learned sit, down, stand and hand targeting. We also learned that she has amazing drive in restrained recalls, and on Wednesday I had the opportunity to work on distraction recalls away from a fence that is adjacent to a dog park where several dogs were romping. I was amazed at how well she did! In this video, the other dogs had pretty much stopped to rest, but her recalls away from the playing dogs was almost as good as you see here. Sunday, adopt!! 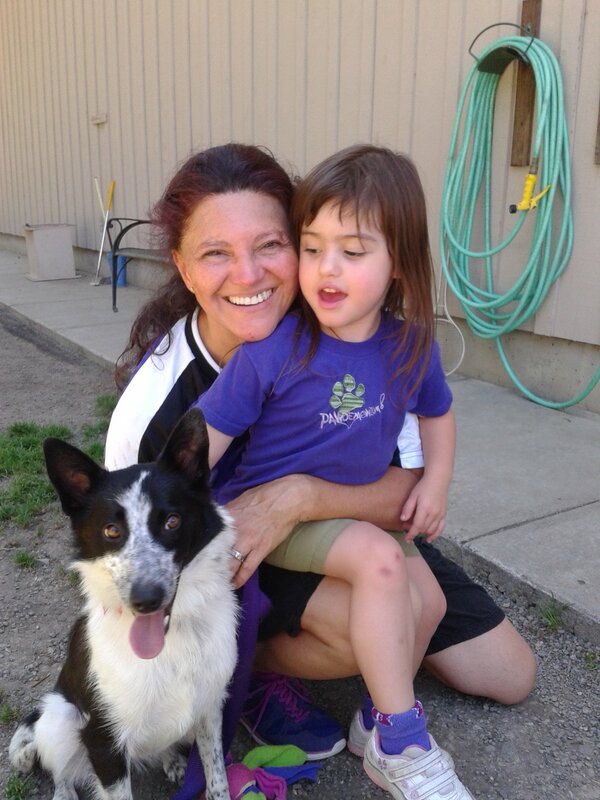 Thanks to the Marin Humane Society, who allowed us to have a flyball tournament at their wonderful site in Novato, I came home from the competition with a wonderful and energetic, 10-month-old border collie puppy by the name of Tesla. Although she is possibly a mix, she is everything I’ve been looking for in a new dog, including incredibly attentive and great with my daughter. First night went fine, as I started teaching her that her name is Tesla by calling her and giving her treats repeatedly. She learns quickly! Wednesday, teach her to tug. I personally love the article on “How to Create a Motivating Toy” by Susan Garrett. I didn’t have to go quite that far with young Tes, since her age makes her playful by nature; simply teasing her a bit with a wiggling tug sufficed. She looked at the toy and pounced on it a few times without biting down, and I marked each time and rewarded with happy play. (She likes to lean into me and get belly scratches.) When she finally clamped down hard on the toy, I tugged ever so gently while smiling and telling her how good she is. Sunday, restrained recalls. After a few days of tugging practice, she was tugging like a champ, and even growling in that high-pitched play growl that tells me she’s having fun. So, we upped the ante with restrained recalls. 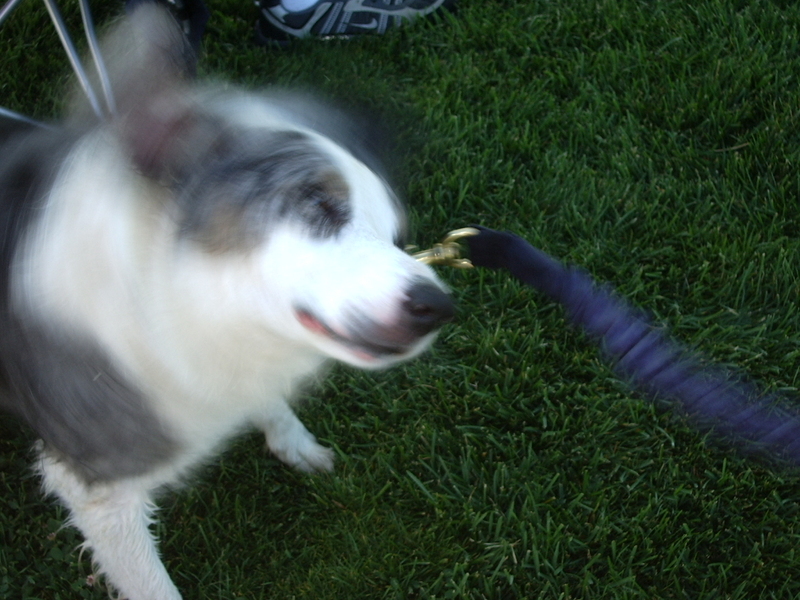 I had a friend and flyball teammate hold her while I waved the tug in front of her and then ran away. When I called her name, they let her go and she raced toward me at full speed, then grabbed at the tug. I engaged in a good game with her all the way back to my friend (starting at about 20 feet, then working up to about 50+ feet). By the end, she was running at me at full speed, and I could hear her play growl 10 feet before she reached me. Wednesday, recalls away from distractions. Today, I took her to the training field that I use, adjacent to a private (members only) dog park. There were 2 large dogs romping around, and they immediately came to the fence to meet Tes. Since I knew from experience that she is fine greeting dogs through the fence (and in person, for that matter) I allowed it. On this first pass, I called her as soon as the other two dogs disengaged from the greeting to go back to their owners, who were calling them from the fence. SUCCESS. On subsequent passes, I called her from higher distractions, at first with the dogs trotting nearby, then working up to them romping hard while I called Tes and ran away from her, waving the tug. I could see that it was not an easy choice for her, but she did come running and engaged in great tug games each time! I ended this session with her wanting to continue to tug, then traded her the tug for a treat as I leashed her, tugged a bit more, then left the park. Next steps. In the coming weeks, the process will include increased distraction recalls as well as recalls in a wide variety of settings and situations. I learned on Sunday that she was not yet ready for a recall adjacent to a distraction, when she ran past me and the tug to greet a teammate’s dog. We finished off Saturday recalls with her running alone. As we progress, I’ll put a long line on her for safety when we are doing recalls with any type of distraction in an unfenced area. Her reaction to the ground squirrels adjacent to the practice field is still an unknown, so we’ll have to be mindful of that. Needless to say, I’m super excited about our new girl. She is getting along fine with the rest of the pack so far, though she’s had a couple of barky arguments with the other BC’s over toys. The good news is that she mostly backs down to the older dogs’ rebukes, and responds well to time outs as well. Meanwhile, she is only with them closely supervised and without high value toys. Keep a lookout for updates on Tesla! I’ll be posting info on her basic training as well as her Flyball and Agility training, which I’m starting simultaneously. Note that, although I won’t be jumping her until she turns one year, there is still a lot that I can work on in both sports with her for the next couple of months. 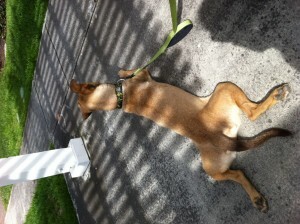 I recently met with a client with a very high drive dog, whom she is training as a service dog. The large, adolescent dog is pretty much everything that I look for in a sports or working dog: high interest in interacting with humans, great play drive, good energy level and mental alertness, and she appears to have a decent structure. Yet, the owner is completely frustrated. The dog has a hard time focusing on her in the presence of distractions (did I mention the dog is an adolescent?) and does not seem able to relax when she needs to. She appears to be always on edge in public, and this has her owner at wit’s end with her. Many people get these very high drive dogs with specific purposes in mind such as working jobs or rigorous sports, but then find themselves exasperated when the dogs are unable to settle down. This “settle” is something that I teach my dogs as a matter of course, from the early stages of puppy training, but many people don’t realize that, with high drive dogs, this topic requires more attention than it might for a calmer tempered dog. Following are several exercises that I recommend to my clients to help their dogs learn the much-needed skills of settling down, impulse control, and calming in the midst of high levels of distractions. Reward Calming Signals – This is one of the first orders of business for many of the consults that I do with nervous or anxious dogs, but it can apply to all dogs. (Certainly applies to all of mine!) Calming signals are specific communications by a dog to say that they are stressed out and are trying to calm or settle themselves. (Many are also used to try to convince others around them to calm down.) Among the most common that you may see in these high distraction contexts are the shake off (as if wet, but the dog is dry), the yawn, and the deep breath or sigh. Mark and reward every time the dog offers any of these signals; soon you’ll start to see them more often. Settle on cue – On the surface, this appears as nothing more than a physical behavior, but the training goes much farther than that. First, to define the settle position, it is actually a “down” where the dog is lying either on her hips (as opposed to in the upright and ready “sphinx” position), or for some wider-hipped dogs, with the rear legs spread out, frog-style. Note that these are positions that dogs typically take on when they are relaxed and not planning to get up very quickly. Both of these can be lured, shaped, or captured, and then put on cue. Following is how I would lure them. Hip settle – from a “down” position, lure the dog from the nose toward the hip until they roll their hip out. Mark and reward this position, and eventually give it the “settle” cue. Frog settle – from a “down” position, lure the dog slowly, straight forward from the nose until their legs push out straight back. Note that I will *only* teach this settle with dogs that already have a tendency to lie down in this position. In both positions, the “settle” should be taught as a sort of “stay” command, in that the dog is to remain in settle until a release cue is given. Advanced “Settle” training – Once the dog is readily settling on cue in quiet settings, start practicing amid mild distractions. Ask for a settle, and reward then wait, keeping the dog in settle. 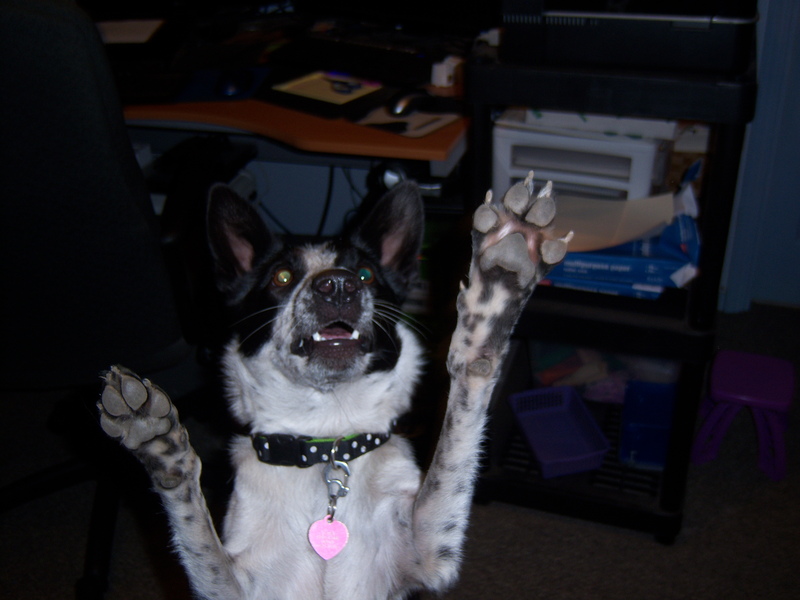 Whenever the dog offers any sort of calming signal – such as a yawn or a deep breath – reward with more treats. If the she flops over onto her side completely (an “extreme settle”) quietly praise and give more treats. As a variation on this advanced settle training, another great exercise is to go someplace with mild distractions and just stand there. Reward your dog for spontaneously deciding – on her own – to lie down. Do this often enough and your dog will eventually learn that down is where you want her if you are not in motion, and she’ll learn to settle herself, even amid distractions. “Patience” games – Self control is another major challenge for many high drive dogs. To teach them to have more of it, I recommend lots of work with “Leave it”, “Drop it” and “wait” for food, as well as stays in general. Another patience exercise that I use (ONLY with dogs that show no food guarding related aggression is to hold a treat at a short distance from their snout and ask for a “wait”. If they move even the slightest bit, the treat goes away. If they manage to keep their nose away and sit still, they get the treat. This teaches them that patience pays off, and impatience does not. Rev it up and then Settle – Once your dog is getting good at the above exercises, you can incorporate play into your settle down exercises. Start this out at low levels before working up to very high drive play. First, play with your dog to get her excited. Then abruptly stop playing as you say “stop”, and drop the toy. (This game works best with tug toys, but can also be practiced with any interactive people+dog toy.) When the dog sits or lies down (I prefer the down), give a treat and quietly praise, then return to the game. Over time, you can also start to wait for a calming signal after the “stop”, before resuming the game. High drive dogs often need more mental and physical exercise than the average dog, but they also need to learn to calm down. If you keep your dog on a routine of mental and physical training and practice these exercises often, you too could have a high drive dog that actually has an “off” switch! 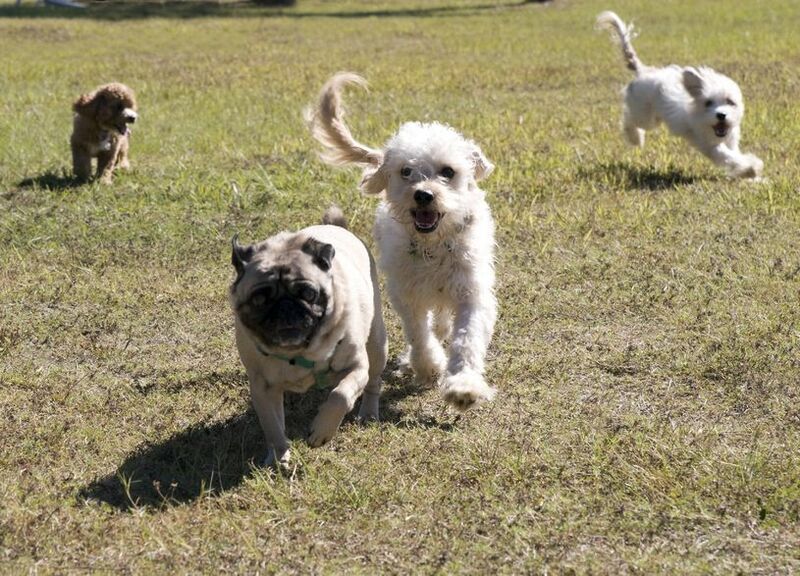 Dog parks are a popular destination for many dog owners, even those who have large yards in which to play at home. These parks allow dogs to romp, off-leash, in a fenced environment. For many owners, it is also a place to meet and connect with other dog lovers. To keep your dog safe, follow these simple rules and remain alert for signs of danger. Have a solid recall (come when called). This will assure that you are able to call your dog out of danger if needed. If you don’t have a solid recall, consider other alternatives to off-leash parks, such as training classes, or smaller play groups, where you can safely practice your dog’s recall before letting him play off-leash with dogs you don’t know well. Observe the humans. If people are chatting with backs turned to the dogs, stay away. While it’s perfectly fine to chat with other dog owners, it’s more important to watch the dogs as they interact. Stand facing your dog, and talk to people at your side. If the other owners are watching their dogs, it’s a safe bet that they are looking out for their welfare. Observe the dogs. Look out for dogs that challenge others, stand over or mount others or bully others. If you see such a dog, you might consider leaving rather than risking your dog’s involvement in a scuffle. Keep in mind, also, that many dog owners do not understand dog body language, so they may not even be aware that their dog is being a bully or an impolite brat. Rather than argue with the owner who insists that his or her dog is “friendly”, it is often better to just leave the park if you are uncomfortable with the interactions between your dog and another. Your top priority is to respect your dog’s needs, so if he doesn’t appear to be enjoying the time, you should honor that. Dog sports are another great option. 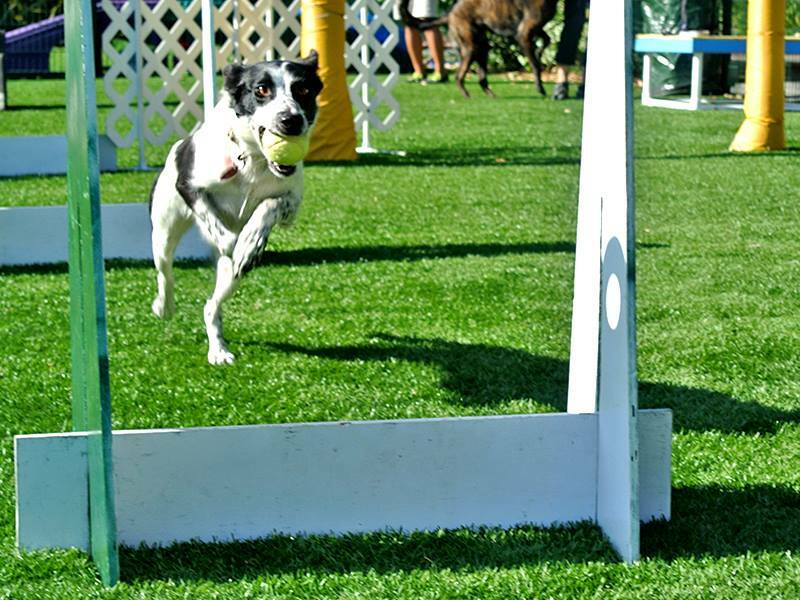 A wide variety of sports are available including Agility, Flyball, Rally Obedience, Canine Freestyle (dancing), Dock Diving, Tracking, Herding, Disc Dogs (Frisbee) and many others. Dog sports encourage better relationships between you and your dog, allow your dog to play off-leash in a more controlled and fun environment, and teach dogs that playing with you is more fun than playing with other dogs – an invaluable lesson in case you need emergency obedience some day. Does your dog panic when you leave him behind? We love our dogs. This is why we take them hiking, hire dog walkers, take them to doggie day care, participate in dog sports and buy them gifts. Unfortunately, we can’t always take them along when we go out. 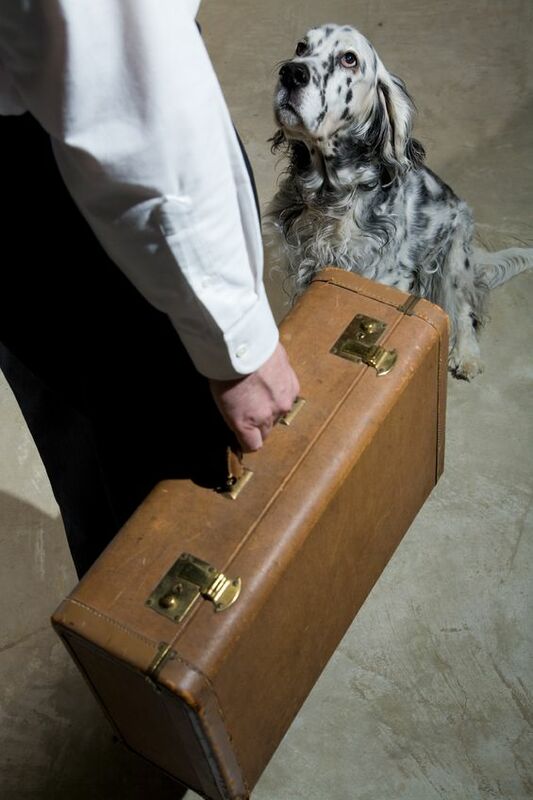 While it can be tough to leave your dog behind, it’s important not to make a fuss about your arrivals and departures, as this can create problems for your pooch. And as the holiday season is upon us, this will be particularly important if we will be forced to leave our pups behind to go visit relatives or attend holiday parties. Unfortunately, not everyone gets to take their dog to work. When leaving for the day, many loving owners start to leave, turn back and see their dog watching them then return for “one last goodbye”. While I have to confess that I’ve been guilty of this with my niece and nephew when I visit, I make it a point not to do this with my dogs (or my kid), as it can cause anxiety and other problems. While there are many causes, separation anxiety, may be exacerbated by lengthy goodbye’s and overly exuberant hello’s. When you leave for the day, the dog knows that you are going. If you behave as if it’s not a big deal, the dog will be more likely to believe that all is well. If, however, you make a fuss, he’ll wonder why you are behaving in such a manner. Over time, this could lead to increased levels of anxiety every time that you leave without him. The same is true if you make a fuss when you return, as he’ll get excited at the prospect of your return, and in this excitement may become destructive or anxious. 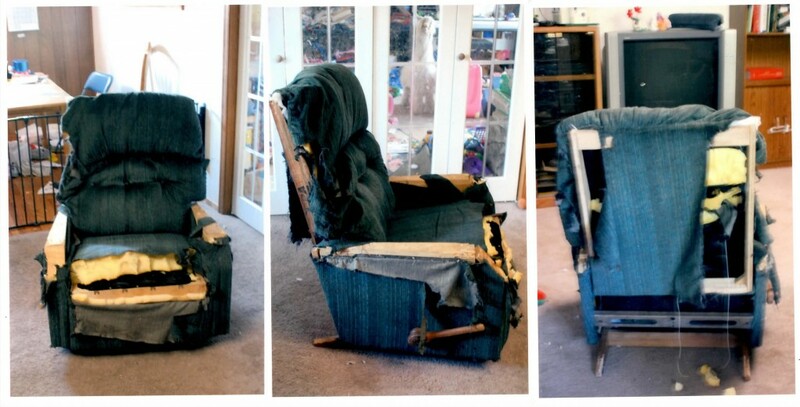 It is important to note that not all destructiveness is separation anxiety; some dogs simply need more to do, so they destroy things out of sheer boredom when left alone. Typically, separation anxiety also involves stress-related behaviors such as hyper-salivation (you’ll notice wetness below the chin, and sometimes down the dog’s chest), inappropriate elimination (urination or defecation) typically near entryways, and much destruction around entry/exit points such as door jams and window sills. Some dogs will even end up injuring themselves in their desperation to find their people. I know of one dog that jumped through a second story window due to her anxiety when left alone. Don’t worry about us – we’ll be fine! Assuming your dog doesn’t already exhibit separation anxiety, what is the best way to leave? Say goodbye in a cheerful voice and walk away. Resist the temptation to look back or to return for one last ear scratch goodbye. When returning home, give a quiet hello as you walk in; ask for a sit or down prior to petting. Save the exuberant greetings for when he does something really great, such as coming when called away from a major distraction. If you have done all of these things and your dog still suffers from what you feel may be separation anxiety, or even just destructiveness when you are away, contact your local trainer for assistance.